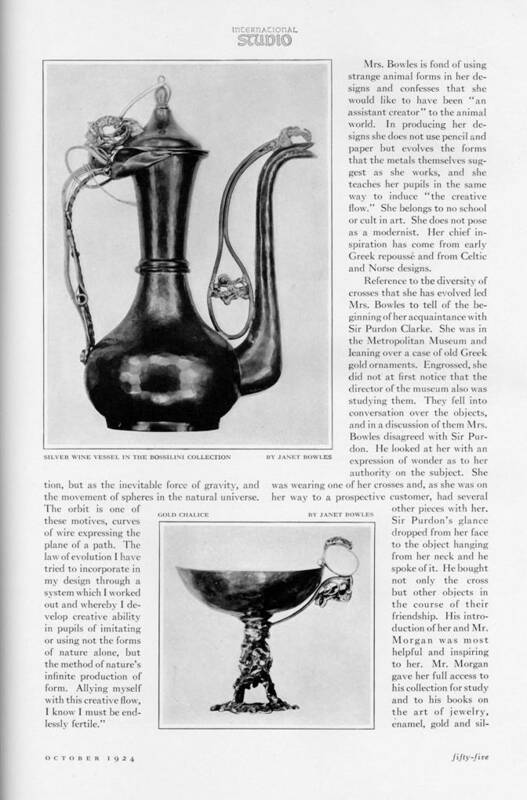 Women have made extremely important contributions to Art & Crafts metalsmithing -- talented figures such as Clara Barck Welles, Jessie Preston, Frances Glessner, Madeline Yale Winn, Hazel French, Margaret Rogers, Elizabeth Copeland, Josephine Shaw, Katharine Pratt, Mildred Watkins, Mary Gage, and others all made their mark. 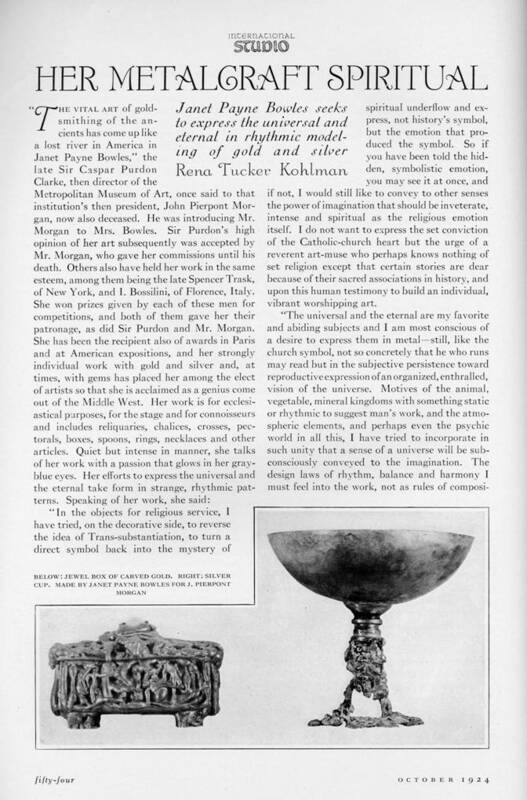 "…found her niche when she met a young Russian metal smith in the wholesale district of Boston. She began working with him in his shop, but the relationship was jarred when he was thrown in jail and charged with trying to overthrow the U.S. government. Undeterred she continued to learn from him through jail visits and with his permission, took his tools to her apartment where she set up a studio. From that time, her commitment to metalworking was set. She served as an apprentice in a jeweler's shop where she learned stone cutting and metallurgy and also studied design. "…early in her life she was dedicated to becoming a pianist but changed when she moved to Boston and her uninsured piano was destroyed when the movers attempted to lift it into her top-floor apartment." "…[They] moved frequently including to Home Colony, a socialist community established by writer Upton Sinclair near Englewood, New Jersey. This venture ended abruptly when a fire destroyed their apartment building and many of the family's possessions including her original manuscript of a novel she later reconstructed. Published in 1917 with the title "Gossamer to Steel", it had the underlying theme of a woman's struggle between personal freedom and duty. "After the fire, the family settled in 1907 in New York City where Bowles began making jewelry and small metal objects. She gained the attention of influential persons including Sir Caspar Purdon Clarke, Director of the Metropolitan Museum, who placed special orders from her and introduced her to J. Pierpont Morgan, President of the Metropolitan Board of Directors. Morgan was a devotee of ancient metal work and, fascinated by the creative talent of Janet Bowles, commissioned her to do work for his personal collection until his death in 1913. 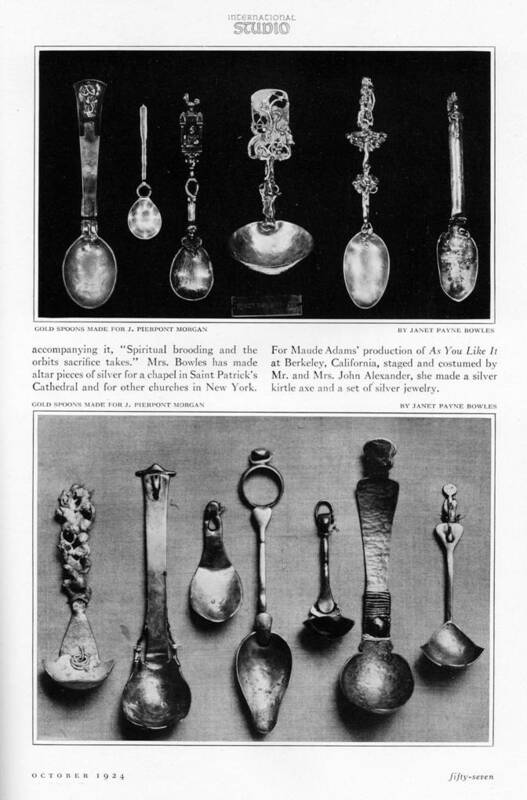 Among the items he ordered were a gold dinner set, spoons, necklaces and rings set with exotic stones. To avoid her making up front financial investments, Morgan furnished the gold and refused to take back any of it that she did not use. 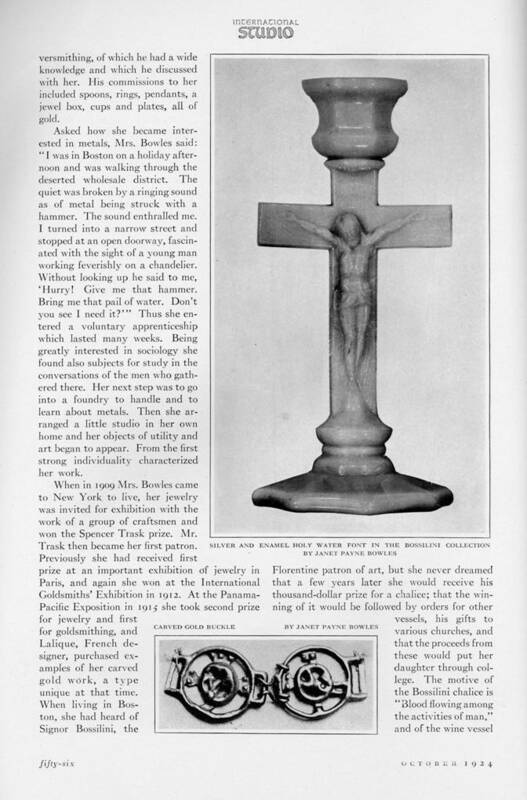 During this period, Bowles associated with Arthur Dow, modernist artist and teacher who stressed spontaneity in art and discouraged tight adherence to preparatory compositional sketches."